LERA's aim is to promote the shooting, collection, conservation and study of the Lee Enfield series of rifles. 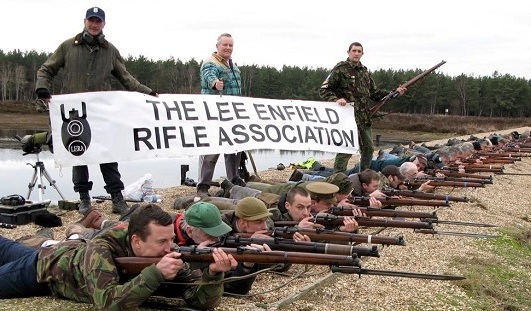 Welcome to the online home of LERA, the Lee Enfield Rifle Association. Most of this website is accessible to non-members, there are no adverts, no dangerous links and no multimedia content. Please feel free to browse the site and plagiarise as much as you like (a credit and a link to us would be nice though). Established 20 years ago by our current Life President and a group of Enfield enthusiasts, we are associated with other clubs and organisations worldwide who share our passion for Enfield rifles. Most of our members are collectors of Enfield and other military rifles and we have sections that specialise in Target Rifle, Transitional Rifles (7.62mm), Service Rifle (b) and Small Bore. We hold regular meetings, shoots and competitions at Bisley and at the MoD's Ash Ranges complex. Membership is just £40 per year for standard members, and only £30 for those over 65 or under 25.